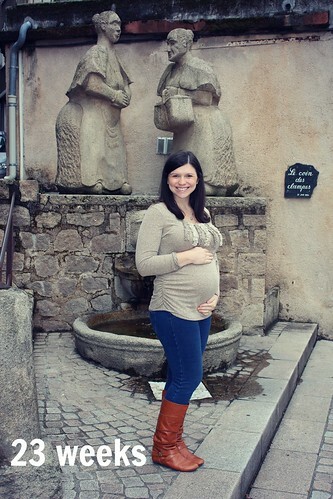 Bonjour, Y'all: Welcome to the 3rd Trimester! 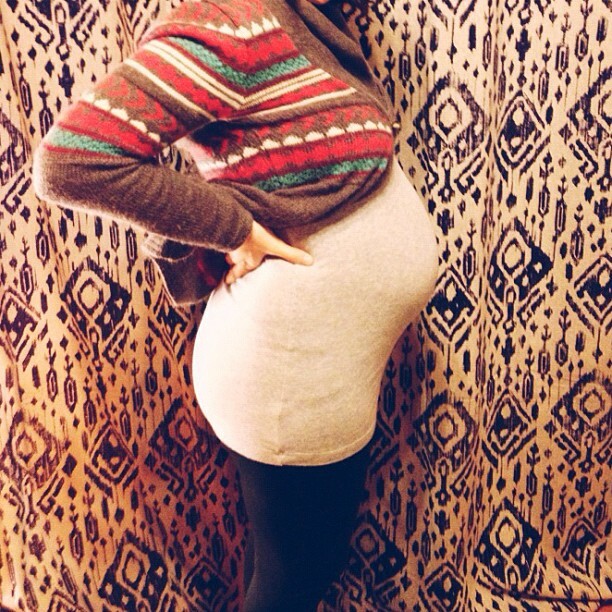 Welcome to the 3rd Trimester! New symptoms: Acid reflux is here to stay... And I find it incredibly hard to bend over and do simple things like put on my socks and shoes! ALSO- I am feeling all sorts of "crowded" on the inside... like taking a deep breath or finishing a BIG meal is quite uncomfortable. I will have you know that my innie belly button probably won't last much longer- shes been hanging on for a few weeks, but she's about read to pop out! Baby Stella: Still moving around with frequent baby hiccups! I can tell the movements are getting more crowded and stronger if that makes sense.... Girlfriend is getting so big that her space is a bit restricted. It's also cool because we can now see her move around from the outside of my tummy- I am trying to catch it on video so stay tuned! We are praying that she will turn when she is supposed to (before it gets too crowded) so that we won't have a breech situation. Total weight gain: According to my doctor, 7 kilograms = 15.4 pounds... BUT from what I hear the greatest weight gain happens in the 3rd trimester so lets hope it stays under control, especially with the holiday season coming up! Clothes: I think France skipped fall and went straight to WINTER- We even had SNOW this week!!! 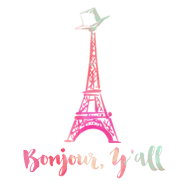 So lately I have been sporting lots of hand-me-down maternity clothes from some nice French ladies and my SIL with lots of layers, sweaters, and scarves. Stretch Marks: Still a resounding YES :( But again, none on my stomach so far. Rings: Still on and happy to report no swollen cankles either! Miss Anything: HUGS... I have "fat man" hug syndrome now haha! Food Cravings: SWEETS SWEETS SWEETS! (And I am not a sweets person) I have traded in my Frosted Flakes for chocolate cereal in the mornings and have been craving cookies and brownies every day... trying to reign this in so that I don't gain too much weight! I seriously can't believe we are on the home stretch... 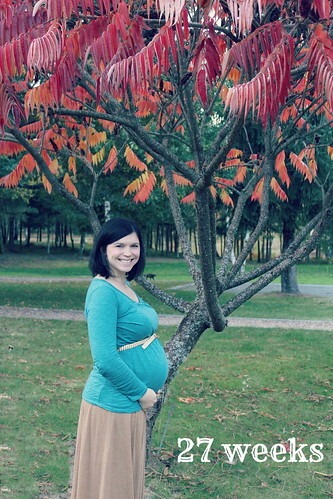 This pregnancy has in some ways gone by really fast, but technically I've been pregnant almost all YEAR because of what happened in February, so it also feels like it has dragged on for quite some time. I know she will be worth it in the end! 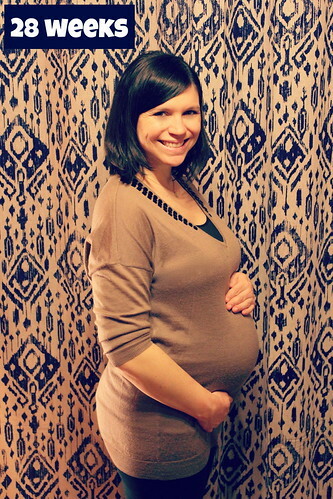 Love your sweet bump and precious Stella;)!! You are on the home stretch!! Enjoy every minute of it (even when your uncomfortable ;) you will miss those sweet kicks and hiccups and believe it or not your belly;) your sweet lil one is worth it;)!!! Love ya! Hugs!! Yay, the home stretch! I'm hearing you re: sleep. I used to sleep on my side with my top leg thrown over a pillow, it seemed to take some of the weight off my hips and find a more comfy position. Hope it helps for you! Chocolate - whatever you do don't try the Christmas papillotes in the stores at the moment. I'm addicted and I'm not (fingers crossed) even pregnant! 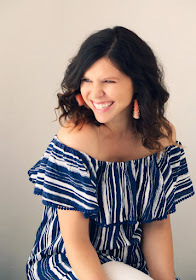 Love the blogpost!! I hope Stella isn't 15 pound but 1.5...not sure because I don't measure metric!! Can't wait to hear about birthing class...had it on my calendar!! You look amazing! And don't worry about the weight gain. I had gained more than that by week 28 and am too shy to post what I've gained at week 37! Love all the pictures!! Can't believe you're getting so close! 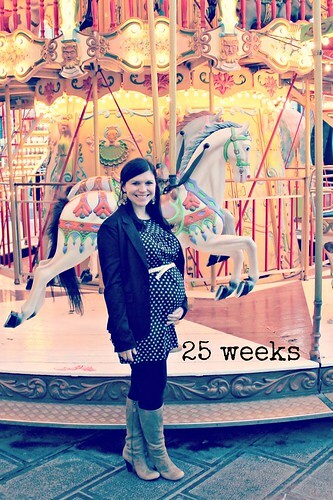 When I saw 76 days to go on the top of your blog I got so excited :) You are such a cute preggo! 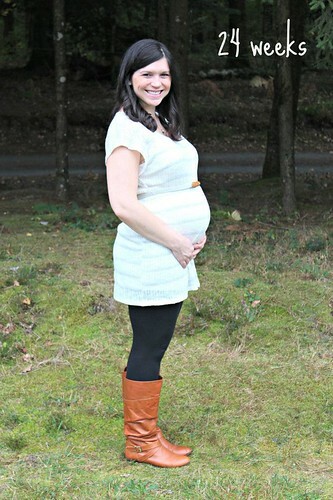 That's going to be one lucky baby. So precious Abby! So happy for you with all of this! You look stunning and beautiful and you're glowing! !